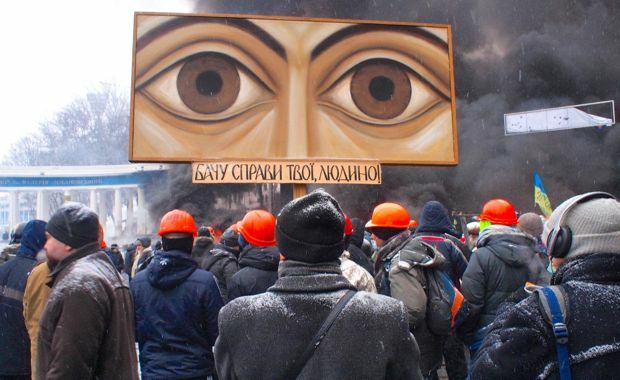 Ukrainian protesters in January 2014. Photo via Wikimedia Commons. 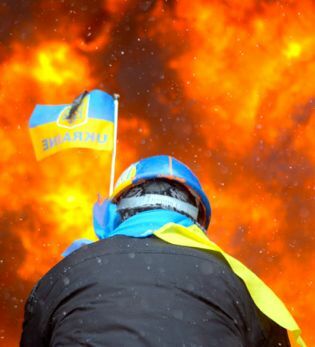 Protester wearing Ukraine state flag colors facing the massive fire set by protesters to prevent internal forces from crossing the barricade line. Kiev, Ukraine. 2014. Used via Wikimedia Commons. In October I taught at an evangelical seminary in Kiev, the Ukraine’s capital and largest city. This was my third time teaching a class on conflict transformation at that school. Many of the students there took me downtown on the Saturday after the class, and we walked in some of the squares where protesters later gathered. Some of those students were among the protesters, although I am giving them some measure of protection in this column by not listing their family names, above. As demonstrations unfolded—first against the policies and then against the government of Viktor Yanukovych—my students kept up conversations with me via the Internet. They shared their excitement as the demonstrations strengthened. They shared their anguish as troops opened fire killing some of the demonstrators. Their shared their joy when Yanukovych fled. Now they share their fears, concern, and anger as Ukrainian Russians seemingly backed by Russian troops have seized control in Crimea and the crisis threatens to erupt into civil war—or war with Russia. TIME magazine’s “Person of the Year” in 2011 was “The Protester.” TIME recognized those “From the Arab Spring to Athens, from Occupy Wall Street to Moscow.” Earlier in a book about the 100 leading figures of the 20th Century, one on that list was the Chinese man who stood in front of the tanks coming into Beijing. The image of this solitary courageous figure has become the icon of the nonviolent protester armed only with conviction, passion, and purpose. Yes, there are leaders and organizers in these events, but usually these movements are not led from above but from below, from ordinary people who band together, sometimes with a grassroots network of leaders trained in nonviolence and organizing, sometimes with little leadership at all and leadership that emerges as events unfold. History is often taught as the story of great figures: Presidents and prime ministers, conquerors and generals, inventors and titans of industry. But in our era the list is growing of nations whose history has been initiated and shaped by ordinary people in the streets, sometimes in ways that open up new hopes and sometimes in ways that unleash unrestrained passions. Sometimes the intense emotions that move people to risk their lives on the streets can erupt into violence. The violence from the protesters is usually provoked by the violence they face from authorities. This happened sporadically in Ukraine as some protesters threw back tear gas canisters, added their own fire bombs, and some soldiers and police were killed. But amazingly in the face of massive repression many protesters maintain their nonviolent discipline and show incredible endurance as they brave hardship to launch new beginnings for their country. So I light a candle for Ukraine and for all my friends who have acted so courageously in hope. I pray that their hopes won’t be dashed by massive violence of other powers. I pray that military forces will be restrained and diplomacy and negotiations will be given a chance. I pray that wisdom will triumph over anger. I pray for peace, a peace that includes the nonviolent pursuit of justice and freedom.